- To Thea, thank you for letting me sob in your arms when my city went up in flames. I’m sorry I made fun of you for being a farm girl from upstate New York. I was a really stupid 17-year-old. You never held it against me but instead just held and rocked me when I couldn’t reach my family. I don’t know where you are but if through some miracle of the cosmos this reaches you, know that I will never forget you. - To Jonathan, thank you for lending me your cell phone to frantically dial my mom and dad’s numbers a thousand times because I didn’t have a phone. I probably used all of your minutes and then some, but you didn’t say a single word, even though you worked like crazy to pay all of your own bills. I also owe you for holding me back when your ignorant roommate said he couldn’t wait to make those “turban wearing carpet riders” pay for the attacks. - To everyone on the 4th floor of Leonard Hall at American University, thank you for your kindness. We were strangers, having only known each other for two weeks, but that didn’t stop you from offering hugs and cookies whenever I stumbled down the hallway in a daze for weeks after 9/11. - To Tynika, thank you for pretending to sleep while I snuck out to catch the 3 a.m. Greyhound to NYC on September 13th even though our Resident Assistant told you to keep an eye on me. - To Jerry, thank you for going to Ground Zero and buying overpriced postcards of NYC with me on September 14th. Your life at home was a mess, and you had to deal with the destruction of our city, but you were still a pillar of strength and general awesomeness. I miss you. - To Sima, Lilia, and Zara, thank you for sitting with me in the amphitheater all those late nights I couldn’t sleep. You schooled me on the Palestinian struggle for freedom and how Palestinians knew so well what New Yorkers were going through that day. You took me to my first protest and got me hooked on civil disobedience. - To Alicia, thank you for the constant distractions. You became my best friend over the course of our four years together. Your extensive collection of 112 slow jams that constantly ran in the background while we did homework was a welcome escape from the news. Thank you for patiently watching all those 9/11 documentaries with me and for letting me cry throughout every last one. - To Professor Samih Farsoun, thank you for introducing me to Edward Said. I was probably the only one awake in class, writing frantically while you ranted about the Balfour Declaration and Western imperialism and urged us to read “The Question of Palestine.” You were rad and you are truly missed. Rest in peace. of being brown or Arab or Muslim was (and still is) a liability. We all know so many people who suffered for that. At the end of the day, though, you dusted off your shoulders and worked those bullhorns at rallies against Islamophobia. - To anti-war activists around the world, thank you for not putting up with the racist propaganda the Bush Administration spat out and for fighting against American occupation of Iraq and Afghanistan. Your tireless commitment to peace and social justice set an inspirational precedent for teenagers, like me, who were coming of age politically in the aftermath of 9/11. more than ever, i believe there is no difference.the most privileged nation, most americans do not know the differencebetween indians, afghanis, syrians, muslims, sikhs, hindus.more than ever, there is no difference. - To my parents and my brother, thank you for being alive. During those hours I couldn’t reach you, I felt like I was in an endless state of cardiac arrest. Hearing Amma’s voice that evening was like listening to the most beautiful sonata ever. You comforted me even though you had just been through hell in the city and didn’t question my decision to come home immediately…just like I didn’t question the “United We Stand” stickers and American flags you put up everywhere in the house and on the car. We’ve had many disagreements over the years, and you don’t always support my leftist ways, but you’re always there and that means the world to me. 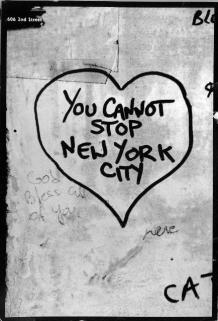 - To New York, my city, my home, my heart, thank you for teaching me swagger and street smarts. You got everyone to work and rebuild together and that was beautiful. But you also had some craziness erupting in Queens with people of color getting attacked by white supremacists. What’s up with that? That’s not what you stand for, New York. You’re the beautiful dream come true—the only place I’ve lived where I can get falafel, biryani, and boba tea all in the same block. Things may not have always been peaceful and perfect but we all got along well enough. Let’s go back to those days when Park 51 wouldn’t have been controversial, when it wasn’t a crime to be brown, when crazy right-wing nut jobs with their Neanderthal perspectives on race and religion weren’t a part of the public discourse, when little Jewish kids played with little Indian and Pakistani kids and it didn’t matter because we all became little Jamaican kids when Alexis’s mom gave us bags of Jamaican ginger candy. Stop trippin’ New York, and let’s get back to righting some wrongs.